Padded protector that fits under child safety seats to prevent any marks, rips and spills and also helps prevent your child's seat from making indentation marks in the seat fabric. It is made from very think material and is specially recommended for leather and premium quality seats with delicate upholstery. Removable, practical and washable. Full height protector, perfect for reward facing car seats and also complete with a handy storage pocket to keep wipes, toys and any other little essential items neatly organised and easy to find during your trip. Helps keep seats protected against spills and compression. Removable, so you can take it off and wash it at any time. Dual grip traction technology holds safely in place. Storage and organisation pocket to keep baby travel essentials. Can be used for rear and forward facing car seats. Full height back and extra high kick mat for rear facing car seats. 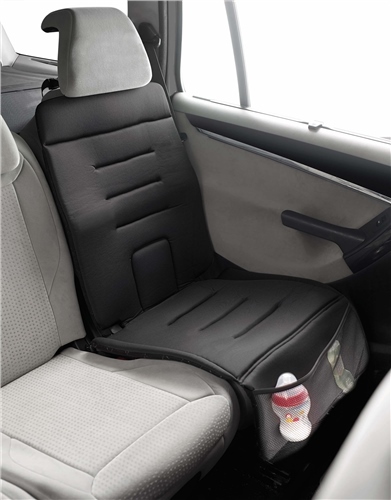 One piece universal design is compatible with all car seats. Designed to ensure the weight of the car seat does not leave any compression marks on your vehicle's seats.